will as bloom and bloom as will. . Wallpaper and background images in the winx vs w.i.t.c.h club tagged: witch winx. That's cute and friendly ( not as many others pics here ) !! I mean , look at them !! Too cute !! 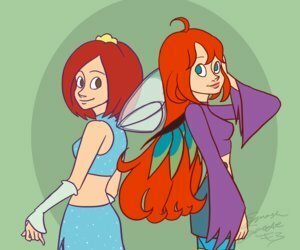 Finally i found someone who doesnt say bad things about winx or witch.Cool picture.Im i the only one who likes both of them? i soooo agree with you PowerOfWater. Finally someone who is peaceful about winx and w.i.t.c.h. Personally i think will is better off show less and bloom is better off showing more but this is really cool. OHH it's the most amazing pic on this club!